What a great and eventful week at Web3D 2016 and SIGGRAPH 2016! Truly demonstrating 3D for ALL. 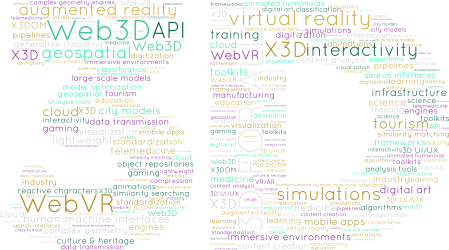 The high quality of the papers, presentations and discussions make us the leading forum for Web3D researchers, providers and users to meet, discuss and test the advancement of 3D on the Web. We would like to thank all our presenters and the Web3D community for their commitment and continued support of our vision for an open 3D Web. A big Thank you to the Web3D 2016 Conference committee members and presenters for their contributions and efforts to make this conference a big success. A special thank you to our keynote speaker Mike Mine and our sponsors EDF and Khronos. Thank you to all our attendees for sharing their knowledge and participating in important discussions on the future of the 3D Web. Apart from the program we hope you had time to network and learn from the Web3D experts at Web3D 2016 and SIGGRAPH. Thank you for visiting us at our SIGGRAPH booth and also presenting at our Birds of the Feather sessions.